Hi friends Welcome to AYESHA'S KITCHEN. Here is my first pickle recipe in this blog. A hot, sweet and sour lemon pickle recipe ever. 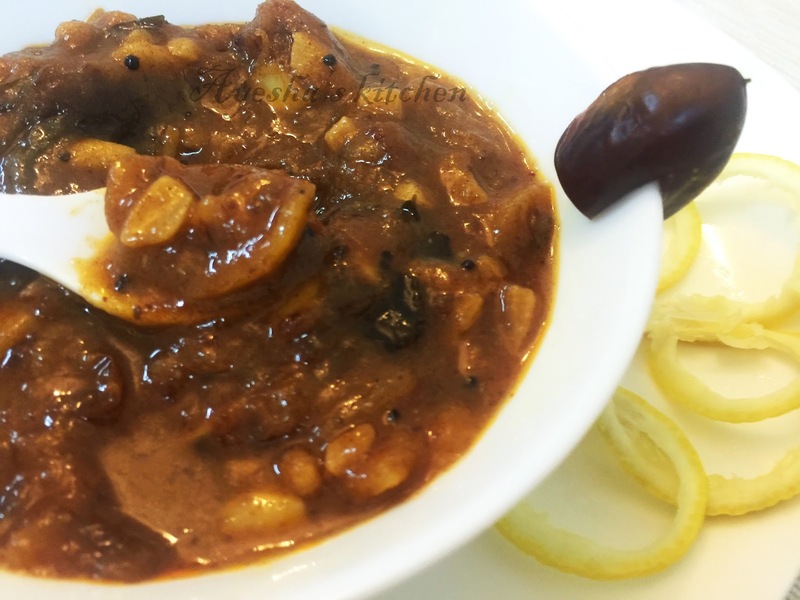 Lemon and Dates pickle is the perfect blend of sweet, hot and sour that everyone will crave for it while having lunch especially with steamed rice and rice soup. It is simply a delicious side dish which goes well with biryani, rice recipes, rice soups/kanji etc.. In kerala, a state in South India this pickle is named as Naranga achar / naranga eenthapazham achar. Moreover, this pickle tastes awesome with brown rice soup and a papad. Woww....a nostalgic feel. So check out the recipe, make it and have with your favorite combo... I am sure you all love this with your heart. Don't forget to drop your feedback... 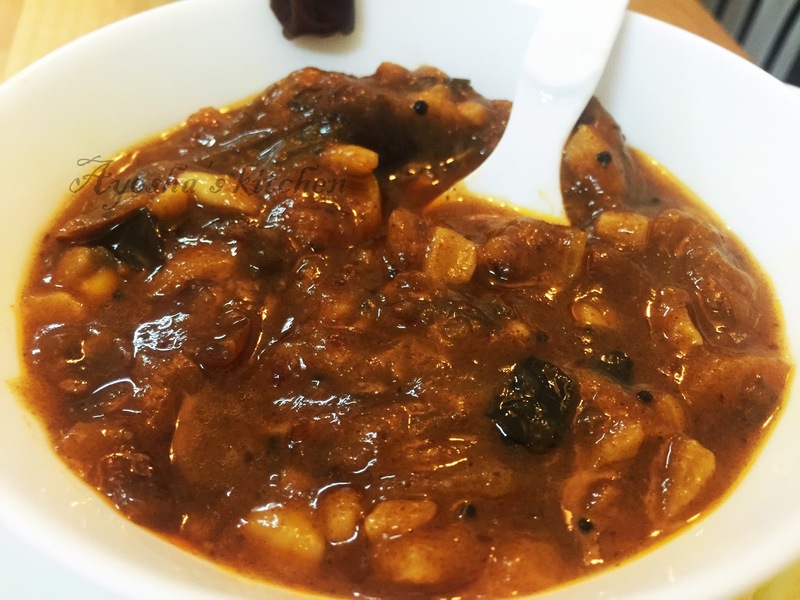 Enjoy..Here is the recipe showing how to make lemon pickle/lime pickle recipe with dates / sweet pickle recipe /homemade sweet pickles. Slice the dates into fine pieces and soak it in water for few minutes. Heat oil in a deep bottomed wok and add pat dried whole lemon to it. Saute till the lemon change the color and becomes soft. This will take around 5 minutes. When done transfer it to bowl and once cooled cut them into medium sized pieces. Add sugar and 1 tsp of salt to this lemon pieces, mix well and set aside. Now heat a pan with some oil. Do not use the lemon fried oil as it will taste bitter. Splutter mustard seeds and then add dried red chili, curry leaves, garlic finely chopped and green chili slit, Saute them till the raw smell goes off and are well roasted. Now make the flame to lowest and then add fenugreek powder, asafoetida and red chili powder. Mix them quickly till the raw smell of the spices goes off. When done add lemon and then dates. Give a good stir. Then add half a cup of hot water and enough salt. Once boiled keep the flame low and add 1 tbsp of vinegar to it. Mix well. And now off the flame. Once cooled transfer to an airtight container and add 2 tbsp of vinegar on top. Keep it for 2 days for best result.